Periodic Operating Point (POP) finds a steady state operating point of switched systems that are periodically driven or self-oscillating. The predominant application of this analysis mode is to rapidly find the settled condition of a switching power supply without having to simulate the entire power up sequence. This dramatically speeds up the analysis of design's behaviour under different load conditions. For further details of POP analysis see the SIMPLIS Reference Manual. Select POP check box on the right. Select POP tab at the top: Enter parameters as described in the following sections. 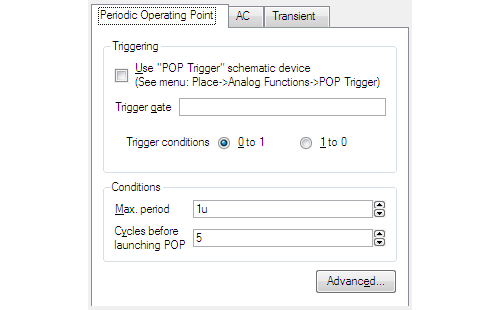 Triggering - Use "POP Trigger" Schematic Device POP analysis requires a trigger signal to indicate the start of each periodic cycle. The best way to define this is using a special schematic part. To place this select menu Place > Analog Functions > POP Trigger. You should check this box if you are using this part. Trigger gate If you do not use the schematic POP trigger device (see above) you must specify a suitable part in this edit box. Enter the full part reference of the device. Trigger Condition The polarity of the trigger edge. Max. period You should set this to a value that is larger than the expected period of your circuit's switching cycle. During each run SIMPLIS expects to see valid trigger conditions. However, if there is a fault in the design of the circuit or a fault in the definition of the trigger conditions, it is possible that none will be detected. The Max. period prevents SIMPLIS from carrying on indefinitely in such an event. Cycles before launching POP SIMPLIS will run a number of switching cycles in a normal transient analysis before starting the periodic point algorithm. This can speed up convergence of POP or in some cases make the difference between POP converging and not converging. If you find POP does not converge, increasing this value can sometimes help. Convergence Sets the convergence criteria for the periodic operating point analysis. The convergence criteria is satisfied when the relative change in each state variable, between the start and end of a switching cycle, is less than this parameter. Iteration limit Sets the maximum number of iterations for the periodic operating point analysis. Number of cycles output After a successful POP analysis, and if there is no transient analysis specified, SIMPLIS will generate the steady-state time-domain waveforms for an integral number switching cycles. This option sets the number of cycles. Use snapshot from previous transient analysis If checked, POP is instructed to take advantage of the last data point of a previous transient simulation, assuming the circuit and the initial conditions remained the same between the two simulation runs. Output POP progress If checked the progress of the POP solution will be output to the data file for plotting etc. This is useful for debugging. 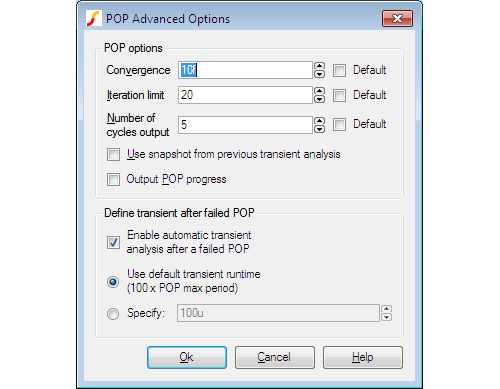 Enable automatic transient analysis after a failed POP If POP fails, a transient analysis automatically follows. This is to help diagnose the cause of POP failure but is also useful in some cases where a subsequent transient may settle sufficiently to perform a study of load transient behaviour. For further details, refer to the SIMPLIS Reference Manual. See SIMPLIS Reference Manual/Simplis-POP/tatements Relating to POP Analysis/.POP/Statement for POP Analysis/Behaviour of POP Analysis after POP Convergence Failure. Use default transient runtime/Specify Run time after failed POP. See above.